Prince Felipe and Princess Letizia yesterday presided over the third Impulsa Forum, hosted by the Prince of Girona Foundation. Prince Felipe speaking at the forum. Don Felipe spoke about the problem of high dropout rates and the crisis youth unemployment. The foundation’s mission is geared toward youth empowerment and solving social problems. 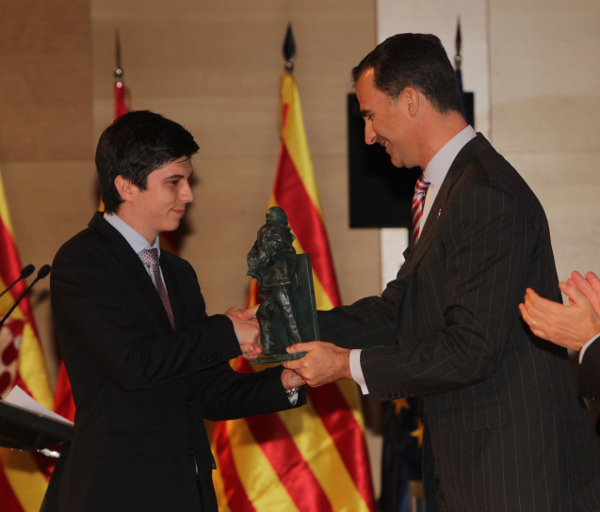 Prince Felipe is not only Prince of Asturias, the heir to the Spanish throne, but also Prince of Girona, the customary heir to the throne of Aragon, which includes modern day Catalonia. The Prince of Girona Foundation is an entity for good but also a vehicle of increasing Don Felipe’s profile in Catalonia, which tends to have a more republican tilt. Prince and Princess Letizia participated in networking events, enjoyed youth performances and visited a Scratch Workshop, which follows a method developed at MIT to promote creative thinking. The magazine Hola, which tracks the Royal Family, noted the commitment by the Prince and Princess to youth empowerment. Business award to Javier Agüera, principal at GeeksPhone. 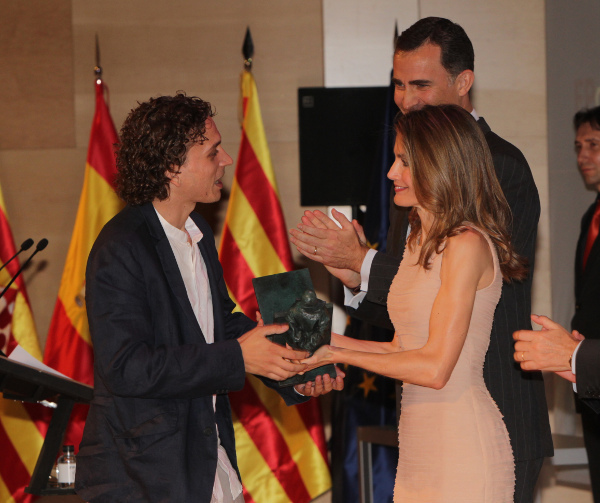 Their Royal Highnesses also gave out awards to young people who have made a difference in various spheres of Spanish society, including the arts and business. Award to Edgar Vinyals Roja for his work on behalf of people with mental disabilities. Also this week, Infanta Elana presided over a meeting of Spain’s Paralympic Committee. One of the topics, of course, was the upcoming London games, the Royal Household said. Infanta Elena at the head table. Plus, King Juan Carlos awarded 127 diplomas to military officers for training to serve in international and cooperation posts, including the NATO alliance. 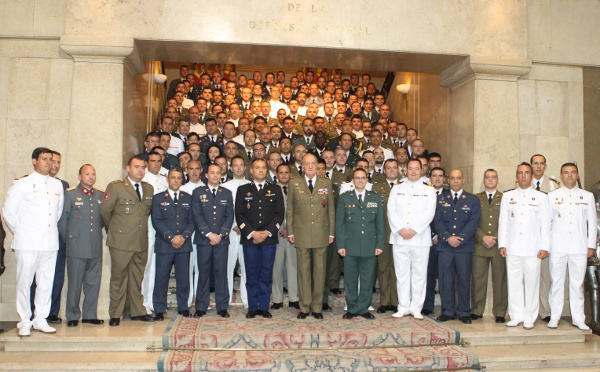 King Juan Carlos with military officers. Princess Letizia took to the streets of Madrid for some below-the-radar shopping while her daughters were in school. Hola magazine took note of her cutting edge fashion. 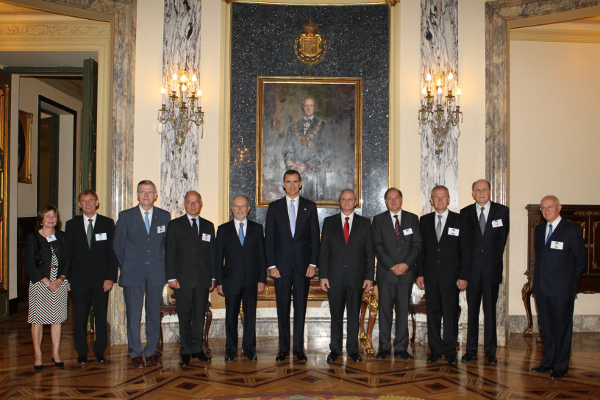 Meanwhile, her husband, Prince Felipe, yesterday presided over a dinner marking a meeting of the Association of the Councils of State and Supreme Administrative Jurisdictions of the European Union at the Spanish Supreme Court. In July, Queen Sofia is scheduled to visit the Philippines. Prince Felipe and Princess Letizia visited New York, New Jersey and Boston last week to call for stronger ties between the U.S. and Europe, and highlight the importance of Spain in American history and its future. The week ended on a high note with an appearance with U.S. Secretary of State Hillary Clinton during the end of the United States – Spain Council’s forum in Jersey City. 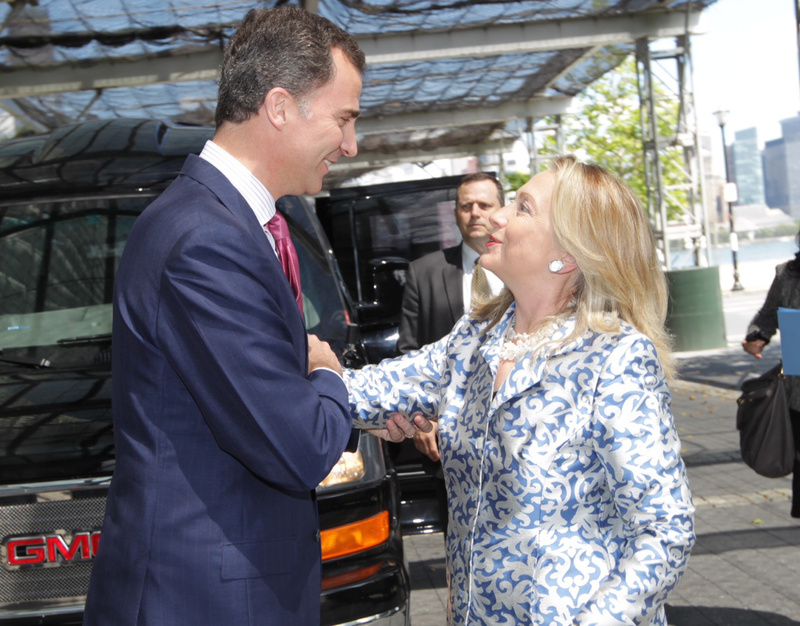 Prince Felipe and U.S. Secretary of State Hillary Clinton. Their Royal Highneses met with Hispanic luminaries, Spanish business officials and other leaders, including the heads of media giants Telemundo and Univision, to boost Spain’s image in the U.S. and relations between both countries, which took a hit during the debate over the war in Iraq. Post-Franco Spain has sought to boost its influence in the world, with a focus on Latin America. It appears the Royal Family and other leaders hope to make further inroads in the U.S. through the growing influence of Hispanics. 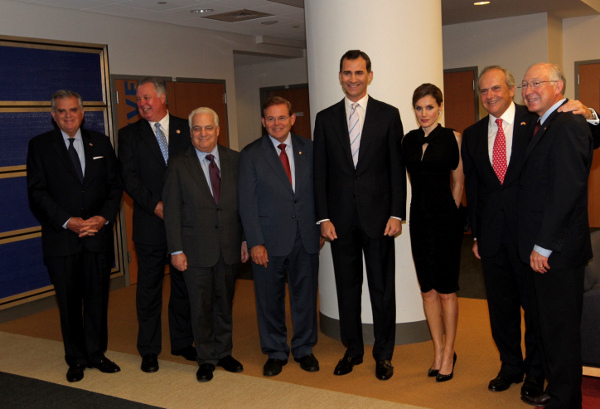 Prince Felipe and Princess Letizia with top Obama administration officials, Interior Secretary Ken Salazar and Transportation Secretary Ray LaHood. Also, U.S.-Spain Council Honorary Chairman Sen. Robert Menendez (D-N.J.). During a speech at Harvard University in Boston titled “Spain: An American Nation” as in other events throughout the week, Prince Felipe highlighted the common histories between Spain and the U.S., and the growth of Hispanic economic, linguistic and cultural influence. Princess Letizia at New York’s Emily Dickinson School. Prince Felipe and Princess Letizia arrived in the U.S. yesterday and visited IESE Business School’s campus in New York today. Like his father, Prince Felipe spoke about Spain’s ongoing economic troubles. He touted recent reforms and called for “more Europe” to solve the continental crisis. He said the monetary union was “weak” and suggested the need for a stronger pact. Their Royal Highnesses participated in a business colloquium and met with students on campus. IESE is an outpost of the University of Navarra and the first European business school to set up a permanent facility in New York. The Prince and Princess of Asturias are also scheduled to visit Harvard University this week. 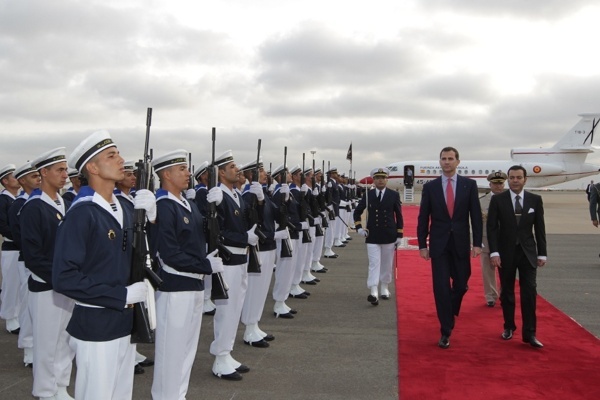 Just yesterday, Prince Felipe was in Morocco. He met with Prince Moulay Rachid and business leaders from both countries. 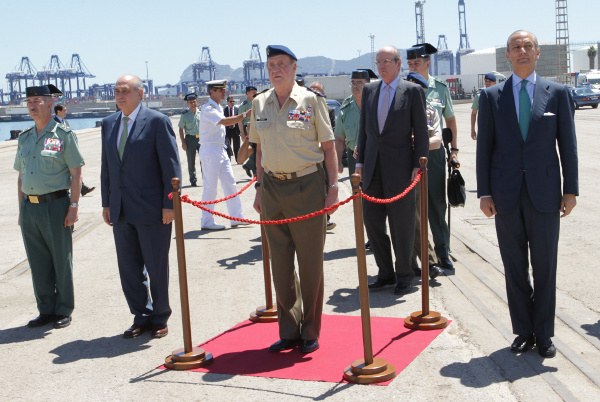 Meanwhile, King Juan Carlos visited Civil Guard facilities near Gibraltar, as scheduled. Some critics in that British outpost are calling to Monarch’s visit as a hostile act. Fishermen wanting access to disputed waters are calling on the King to intervene on their behalf. Spanish forces have already escorted them on fishing trips. Queen Sofia is holding down the fort in Madrid. She presided over a meeting of the Royal Patronage for Disabilities and assisted an event organized by the Indian Embassy. She went with her sister Princess Irene. 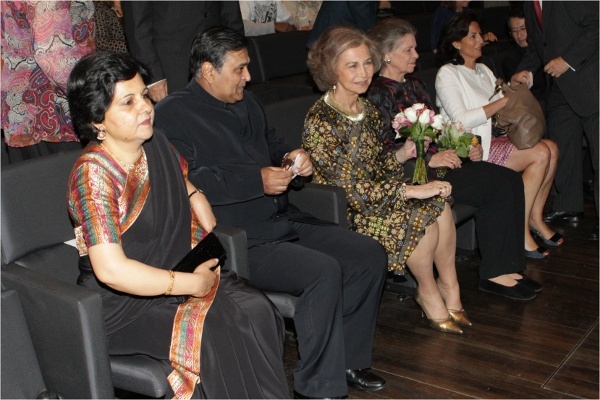 Queen Sofia with the Indian ambassador to Spain. King Juan Carlos met today with Saudi King Abdullah Bin Abdulaziz Al-Saud to express his condolences for the recent death of Crown Prince Nayef bin Abdul Aziz. 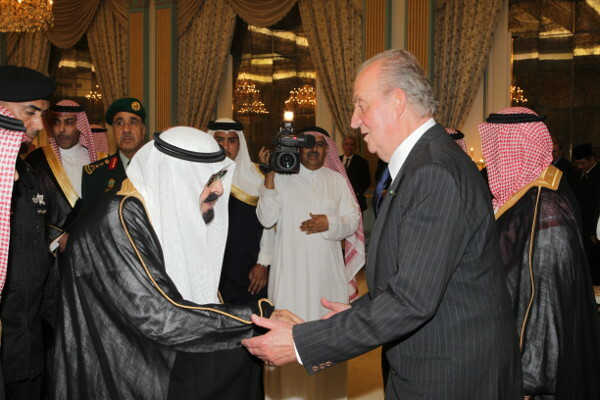 Don Juan Carlos also met with the new Crown Prince Salman Bin Abdulaziz Al-Saud. He’s Minister of Defense and was in Madrid earlier this month. 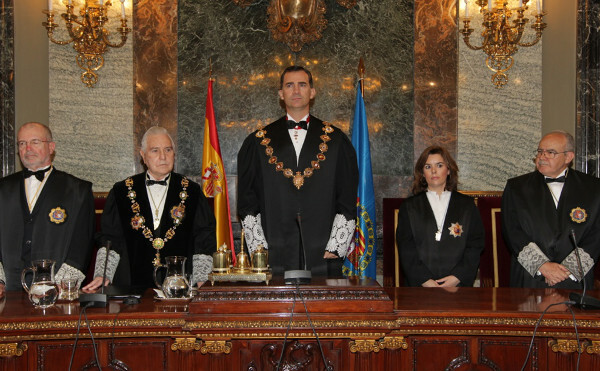 Meanwhile, Prince Felipe presided over the 200th anniversary of the Supreme Court, which was created by the Cádiz Cortes as a result of the Cádiz Constitution. King Juan Carlos will travel to Saudi Arabia this week to meet with the Royal Family there and express his condolences over the death of Crown Prince Nayef bin Abdul Aziz, a half brother of King Abdullah, according to Spanish media outlets. 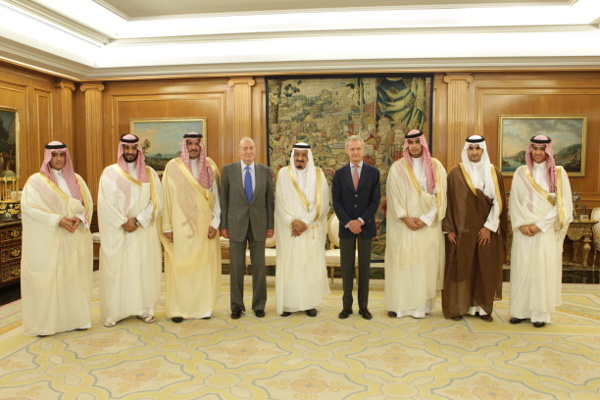 King Juan Carlos with the Saudi defense minister and other officials earlier this month. 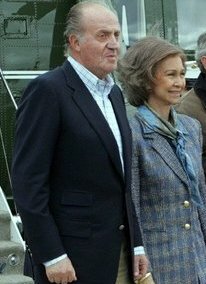 Don Juan Carlos is close to the Saudi rulers, a relationship that has helped Spain cement economic ties with that country. The trip abroad means the King will miss the ceremony to mark 200th anniversary of the Supreme Court. Coincidentally, the Court’s president has been involved in a scandal over lavish trips. Prince Felipe will take his father’s place at the event. Prince Felipe and Princess Letizia will visit the U.S. next week to reinforce bilateral relations. The Prince and Princess of Asturias will visit New York and Boston, including Harvard University’s Kennedy School of Government. They will meet Spanish business leaders and hold discussions about American relations with the Iberoamerican world. Princess Letizia also plans to visit an elementary school to promote the Spanish language. A trip to Washington, however, does not appear on the calendar. Also next week, King Juan Carlos will visit Civil Guard installations in Algeciras near Gibraltar. The visit has broader political implications with Spain calling for talks with the United Kingdom on Gibraltar’s political status and a dispute over fishing rights in the area. Later this summer members of the Royal Family will rest at Marivent Palace in Palma de Mallorca. However, the Duke and Duchess of Palma won’t be there, according to media reports. The Duke Iñaki Urdangarin remains under investigation for corruption allegations.